We babysat our great-nephews Austin (3rd grade) and Leo (preschool) Saturday night. He's changed a bit since then. I arrived first, my date delayed picking up a brother at the airport. I was greeted by disco music, a bobbing Leo and mom Katie rocking out, informing me it was Dance Par-tay Time. I did my best catwalk entrance, jazz hands slightly hampered by a shoulder purse and Trader Joe's bag filled with babysitter accountrements: New Advent calendar, holiday books, Yahtzee game (Note: Did you know some people now play this game on their iPads!? (Wowser -- this new term courtesy of Leo -- and here I just figured out how to install the Weather Channel on the Mini), and, yes, a gingerbread train kit. Well, dad Ryan's invite did say, "4 p.m. till ??" We did not need to worry about tearful "Mamamamamamamama's" this year -- Christmas was in the house and Leo was all over it. Punctuated by "Wowsers!" and "Dudes!" (Austin's mot du jour), we paid homage to Frankie Joe, the shelf elf, and speculated where his next stop would be. . .
We named Leo's nutcracker Elvis and nearly dislocated our respective jaws imitating his (Elvis that is) oral agility. . .
We admired the Christmas tree and did a detailed examination of each Christmas ornament worthy of the most scholarly archeologist, finally figuring out how Superman emerges from one side of the telephone booth as Clark Kent enters the other. . .
My arm was inscribed in invisible ink (the secret decoder flashlight later revealed the message "Brad *heart* Mary" -- awwww). . . While nibbling on some chocolate-peppermint holiday bark and vanilla wafers, we discussed Santa and Christmas lists (per Austin, big sister Reilly's is as long a coffee table). . .
Read the first chapter, ie, December 1, of the Nutcracker Advent calendar four times. . . Gave Coco, the faithful chocolate Lab, a bone. . .
And put pizza in the oven. Enter my date, back from the airport. Repeat all steps above. Except the pizza was done. Pizza finally consumed, Gonzaga basketball game on -- Leo finally cut to the chase. "Mary. Can we make the train?" Indeed. We bust open the box. Organized the pieces and began initial construction. 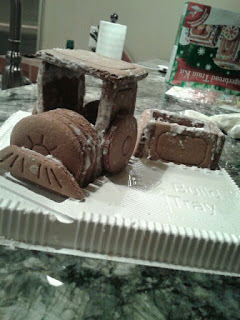 And despite mixing up the the sides of the caboose with the sides of the engine resulting in a a major re-do, phase 1 one of the train was done just in time for. . . There's a learning curve here, folks. OKAY? YAHTZEE! Old school, baby. Right out of the box. 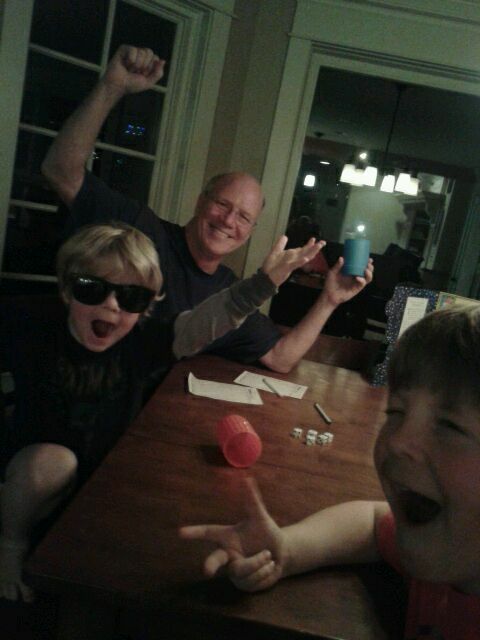 Back to Yahtzee. Dice flew. Boys hooted. Gas was passed (Leo was the only who said, "Excuse me."). Debates ensued about what constituted a True Roll. More debates ensued about what constituted Three Rolls. Score sheets were calculated and recalibrated. And before each fateful roll, the cup of dice of was blessed, kissed and blown upon for good luck by all at the table. 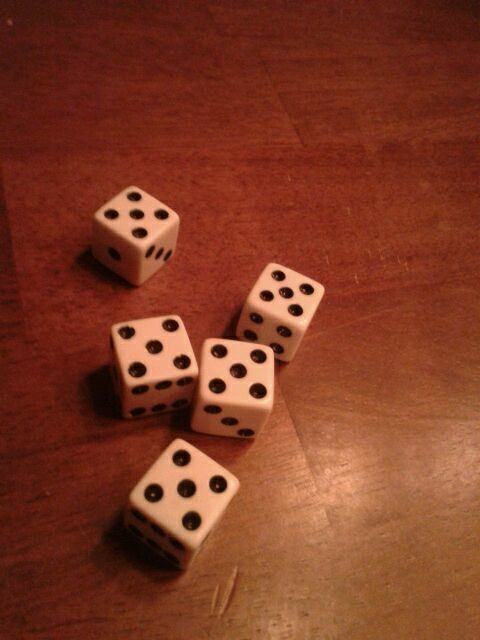 My date rolled a Yahtzee. And Gonzaga won. The house erupted. There was was mayhem in the streets. I'm pretty sure we toppled right over the fiscal cliff. But no. 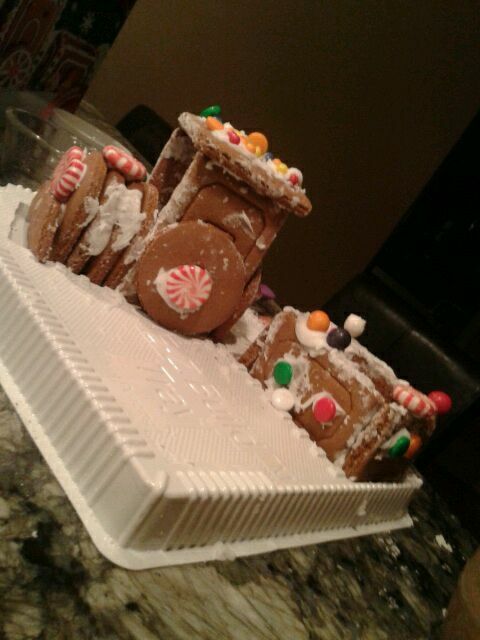 It was time to decorate the gingerbread train. I took charge of the frosting, dibbing and dabbing on command. Peppermint candies and round jelly beans of all sizes whizzed through the air (some right into the welcoming mouth of Coco. . . and, well to be completely honest, Austin and Leo's. . . sorry, mom and dad). My date took responsibility for securing candies that didn't want to stay in place, and 20 minutes, plus two pairs of sunglasses, later, we had ourselves a gold standard gingerbread train. Satisfied with a job well done, Austin and my date wandered off to the family room, clicked on "It's a Wonderful Life" and curled up on the sofa in front of the fire. Leo lingered, gazing at our train thoughtfully, almost wistfully. "You know, Mary," he said with the awed solemnity that only a 3-year-old can muster. 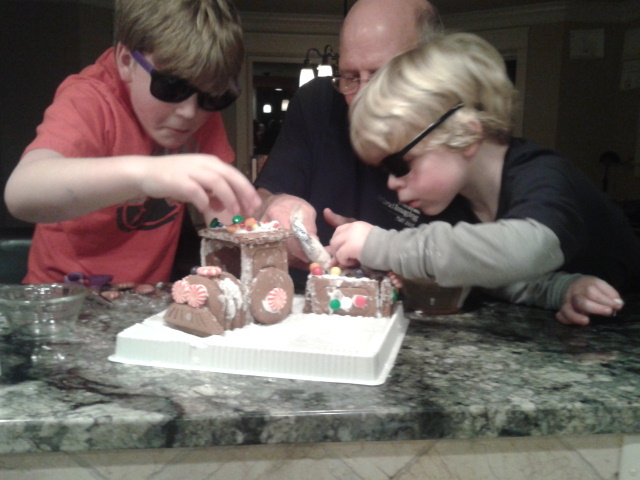 "I think my mom is really going to like this gingerbread thing."